This is a locational surname of Olde English and Anglo-Saxon pre 9th century origins. It derives from former residence at the town of Southwell in Nottinghamshire, or possibly from a place or places called originally 'sud waella', translating as the 'spring to the south'. 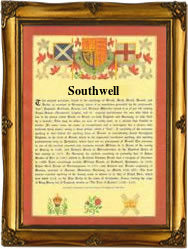 The surnames of Northwell and Norwell, Eastwell, and Westell, also exist in small numbers to confirm that the origin is correct. The town name is a very early recording being found in the charter rolls for the year 958 a.d. in the spelling of 'Sudwellan' and then again at the time of the famous Domesday Book in 1086, where the spelling is given as 'Sudwelle'. The 'd' in these ancient spellings gave a sound similar to the modern 'th' or the Welsh 'dd'. Although arguably the name is from Nottinghamshire, the earliest church recordings are in London. The reason being that people who travelled away from their home area, were most easily identified by their new neighbours by the name of the place from whence they came. Early examples of the surname recordings include John Southuell of Babworth, Nottinghamshire, on January 27th 1639, and (another) John Southwell, but from a century later, who married Mary Barlow at St Lukes, Nottingham, on August 19th 1735. The name has six entries in the National Biography, the most famous, or perhaps infamous being, Sir Robert Southwell, who perhaps more than any other person, was responsible for the destruction of the monasteries under the command of King Henry V111. The first recorded spelling of the family name is shown to be that of Sir Robert Southwell, which was dated 1504 - 1564, privy councillor and master of the ordnance, during the reign of Queen Elizabeth 1st, known as 'Good Queen Bess', 1558 - 1603. Surnames became necessary when governments introduced personal taxation. In England this was known as Poll Tax. Throughout the centuries, surnames in every country have continued to "develop" often leading to astonishing variants of the original spelling.